Figure 1. Knickers the cow, the Mona Lisa of internet attention. 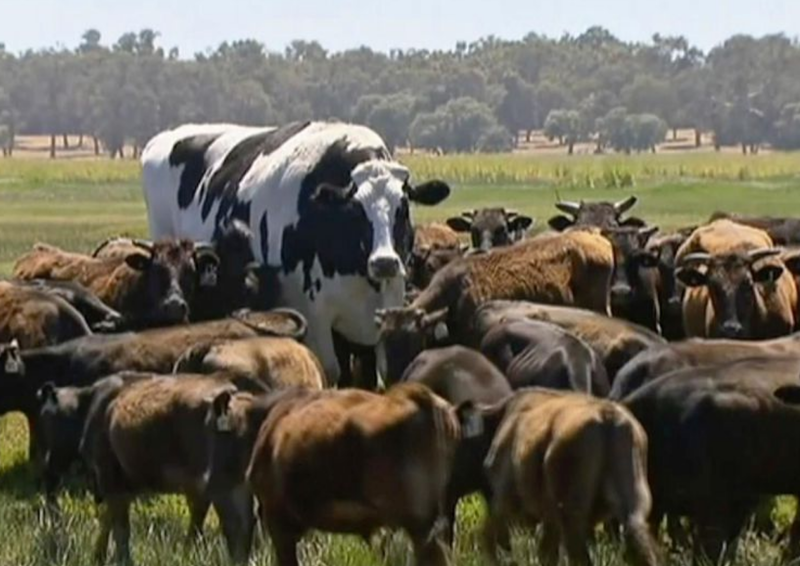 Someone on Twitter posted that all the news should just be giant cows, always. Everybody wants to explain Knickers the cow ("a steer, not a cow, you ignoramus!" says the New York Times), but I just want to look at all the giant cows, kittens, sloths, dogs, and otters all day, at this point. I saw a headline the other day stating that the president was in a "terrible mood" on his way to the G20 summit. I am "voted for George Washington" years old and have never before seen presidential moods reported, as if he's a toddler being picked up from day care and we're the harried moms being given the slip of paper with a smiley or frowny face. Is it heresy that, just for a minute every December 1, I wish they'd cancel Christmas and all the other winter holidays and just let us have a good, long rest? A Rest Holiday, where you eat whatever's in the house instead of cooking and read and watch old movies? Heresy? Okay, moving along. Liz Lenz's "I'm a Great Cook. Now That I'm Divorced, I'm Never Making Dinner for a Man Again" is getting a lot of attention on the interwebs. It's a good essay, but who would ever cook twice for a man who rates every meal 3/5 stars--or indeed, any man who ever rates a meal at all? What kind of partner greets any meal that someone cooks for him/her with other than profound thanks? It reminds me of those scenes in The Marvelous Mrs. Maisel when Midge puts on a fetching negligee and full makeup to go to bed, then sneaks out to the bathroom to put in curlers and apply face cream after he's asleep. Someone should write about "cook until you drop for ungrateful men and then stop" theme in women's writing. Mrs. Dalloway has glimmerings of this. Nora Ephron's Heartburn famously has her dumping a key lime pie over the head of her lying, cheating husband with the greatest reason of all time. Paraphrased: "If I hit him with a pie, he won't love me, but he already is cheating on me and doesn't love me, so I have nothing to lose"--and bam! I hope that really happened, and I would love to see any picture with Carl Bernstein dripping with key lime pie. In Marilyn French's The Women's Room the main character has a similar realization re:cleaning the house. And in Joyce Maynard's At Home in the World, she throws an entire Christmas buche de Noel and the rest of the dinner in the trash because she's fed up. Sadly, we do not have Rest Holiday. Instead, we have "grade all the things" and "write all the things," so that's enough with the reveries about women who have just plain had enough and are ready to throw something, which I now see is the real theme of this post. Signing up for cancelling Christmas and having a Rest Holiday instead! And on women who cook/stop, I think there's some such moment in Margaret Drabble's The Middle ground, but most of my fiction is still packed and I can't look it up. It's the sort of trope that Drabble should have somewhere, anyway. I will join you in your utopian society with all the resting and the movies and the not cooking. The thing that is making me crazy right now is Tiny Boy saying he's STARVING and will I cook him X and then I go to the trouble to make X and he is no longer hungry or willing to eat X and proceeds to ask me to do other things for him.